Clockwork Watch is an odd project consisting of various transmedia projects. The comic book is an adaptation of the original story written by Yomi Ayeni, its new format worked by writer Corey Brotherson and artist Jennie Gyllblad. There are currently 2 books, Arrival and Breakaway, both of which follow lead character Janav Ranbir. The story is set in a retro-futurist Victorian England, placed firmly in the Steampunk genre, and it revolves around the creation of clockwork androids which have gradually advanced to become prominent in the society. A major player in this movement is Chan Ranbir, a genius scientist and father of Janav, the story’s protagonist. The narrative starts with the Ranbir’s arrival in England and the first forays into the creation of the clockwork people, following Janav’s struggles to assimilate into this new society he has been thrust into, while simultaneously dealing with the tears the move is creating within his family. It is these early years that Arrival shows us. Gyllblad’s artwork is certainly striking through both books of Clockwork Watch. Utilising a style akin to watercolour painting, she has developed an incredibly dynamic look, giving a good sense of movement, something that is essential given the action element of the story. However, though Arrival is good, it wasn’t my favourite. It’s well drawn and written, establishing an interesting premise rooted in a genre I love, but the childlike appeal of it didn’t click with me. It’s well done and presumably deliberate, fitting the tone to the age of the main character, but felt slightly disorienting for older readers. 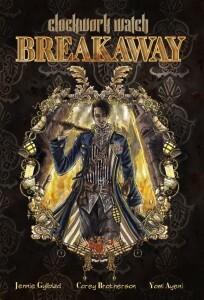 Don’t worry though, because Breakaway follows it. The second comic of the series sees Janav as an embittered young man, a member of the government’s Clockwork Watch, a department set up to keep tabs on the now huge clockwork population, and the pro-machine Mechanist movement. It’s somewhat of a change from Arrival, to say the least. 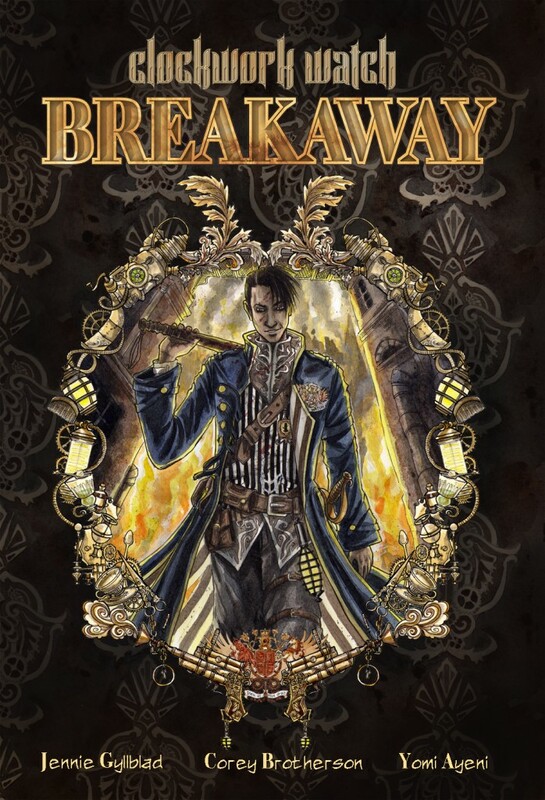 Far from the well conceived but child friendly first book, Breakaway sets its flag firmly into adult realms, as we see Janav get with a clockwork prostitute, fight “clocks” (as they’re colloquially called), and even get all sweary. It’s a far reach from the innocence of Arrival, and it’s great, as the world has new breath pumped into it’s lungs by Brotherson and Gyllblad. This second installment is even more well-written than the first and I found the adult tone to be hugely engaging. While Arrival works, Breakaway struts, truly enveloping the reader in the world of Clockwork Watch and delivering a series that is well worth investigating.